The 2010 Toyota 4Runner will be revealed Sept. 24 at the Texas State Fair. A teaser shot is shown. 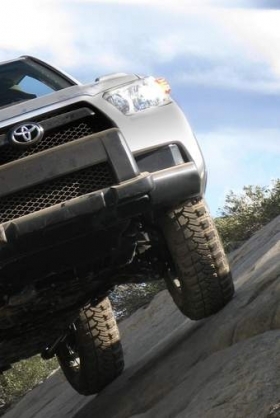 In a nod to its rugged nature, the 2010 Toyota 4Runner will debut on Sept. 24 in Dallas at the Texas State Fair. More details will be revealed then, but Toyota hinted today that the interior will be upgraded with added room and comfort for the fifth-generation sport-utility vehicle. More than 1.8 million 4Runners have been sold since the launch in 1984, and Toyota says 70 percent are still on the road. The current model offers V6 and V8 engines and available four-wheel drive.